Download and install GetThemAll to your Windows Phone or Android-based mobile device. Install GetThemAll Receiver. After it is installed, you will see the IP address and the passcode, both of which can be updated with the click of the Generate button. Go to the Options tab to specify the target folder to which you want to download your files. Launch the GetThemAll app and open File Manager. 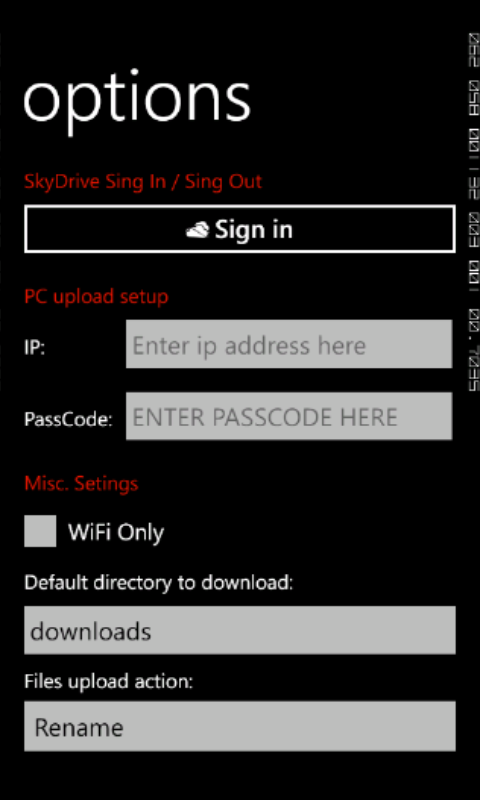 Choose the files that you want to send to your PC and tap Send to PC. 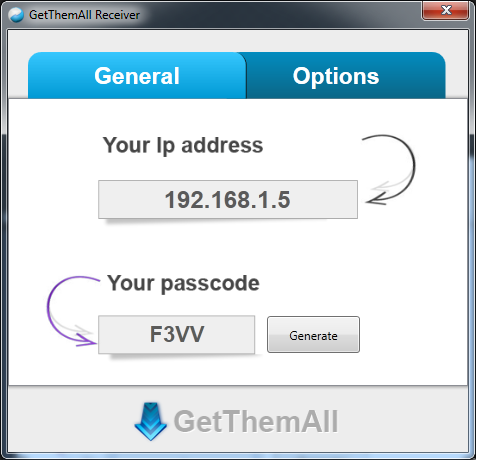 Type in the IP address and the passcode you received in the GetThemAll Receiver interface and tap Sign In. The files will now be sent over to your computer. I can’t send any files! What should I do? 1) Start by making sure that your phone/tablet computer is connected to the same Wi-Fi network as your PC. If Wi-Fi connection is not active, you won’t be able to send any files wirelessly! If that’s the case, use Microsoft Zune and the cable for it. 2) If you have an active Firewall, don’t forget to allow GetThemAll in the settings and add it to the list of trusted software. 3) Make sure that Server service (Control Panel - Administrative Tools - Services) is running. It should be on for the GetThemAll Receiver to work properly.